The 7000 horizontal-truss moldboard design provides incredible strength, durability and resistance to bowing. Ten laser-cut support ribs add exceptional vertical strength. 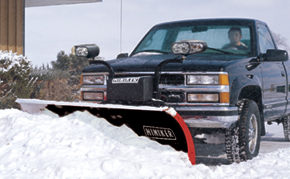 The corrosion-proof poly moldboard is dent-resistant with less surface friction for easier plowing and greater efficiency. In addition, impregnated color means long-lasting, good-looking appearance. 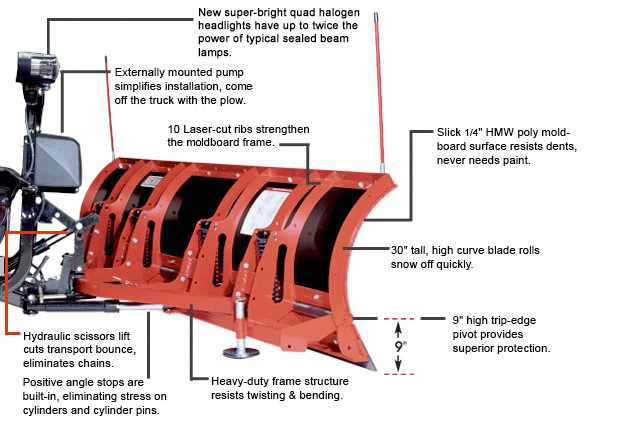 Commercial plowers will appreciate the extra strength and efficient design of the 7000/8000 Series plows. Convenient, compact joystick control mounts anywhere or can be hand-held. Optional clip-on box ends reduce spillage in both forward and backdrag positions. C-Plow shown with optional rubber cutting edges.